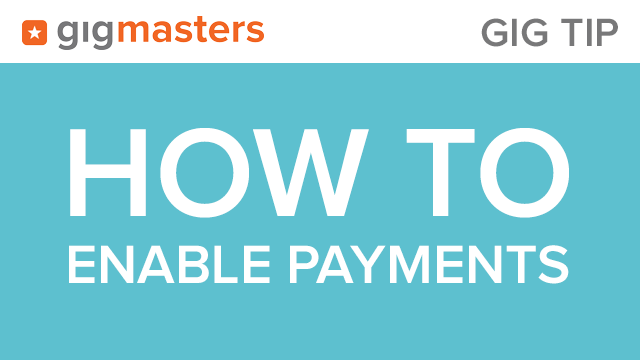 It’s free: Unlike PayPal or Square, there’s no added cost for using this feature. It’s simple: Log into your account, and in just a few quick clicks, you can enable online payments from clients. Forget the hassle of invoices, depositing checks, or paying added fees. It’s secure: We use ACH, which means your bank account information will remain encrypted in our secure database. Here you can authorize GigMasters to deposit funds directly into your bank account. You have the option to allow this for just deposits, or for both deposits and balances. The maximum deposit amount is $2,000 and the maximum balance amount is $5,000. Under Banking Information enter all of your bank account information. When you're finished, select the Click Here Once To Update button. If you have any questions, contact GigMasters anytime.